With 60% Salmon and 26% Potato - for allergy sensitive dogs. Grain Free Natural Dog Food with Salmon, Potato and Vegetables. 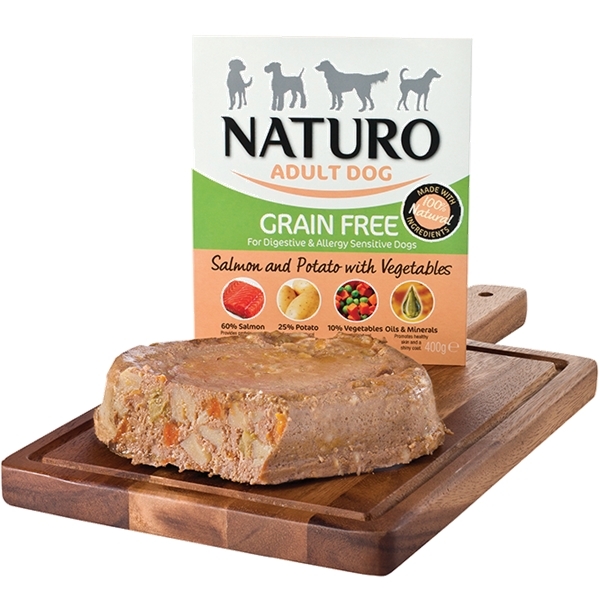 Naturo's grain free dog food is ideal for dogs with digestive issues or allergy sensitive dogs. No colours, preservatives or flavours are used in Naturo's wet dog food recipes or when being cooked. Our grain free hypoallergenic dog food is suitable for all adult dogs and recommended by many for its hypoallergenic qualities. This sensitive dog food does not contain rice.